I am quick to acknowledge how incredibly fortunate I have been in my career as a Naval Officer. I continue to be blessed with amazing opportunity surrounded by amazing people doing amazing things. I liken my career in many respects to The Matrix. I am not claiming to be Neo, but I will freely acknowledge that there continues to be more than a couple of mentors who have played the role of Morpheus throughout my adventure. Every couple of years as part of the detailing process I am asked, figuratively speaking, which color pill do I want this time around? Each time, I opt for red. Unfortunately, as I approach 25 years of service, the bottle seems rather empty. To make matters worse, there are fewer and fewer red pills at each turn. Have I ingested my last red pill? The red pill that has allowed me to dive ever deeper into the rabbit hole? The red pill that allowed me to be Commanding Officer of Navy Cyber Defense Operations Command? Continuing with that metaphor, I’ve been fortunate to explore parts of the matrix that I never dreamed of seeing. It’s the excitement that accompanies such exploration that has me in denial that it may very well be time to pop that blue pill and wake up from this amazing dream. For that reason, I recently reached out to the leader who doles out the pills, making it clear that I was still up for a red one. Earlier this week, I had the opportunity to address a room of junior officers to talk about ongoing operations and our shared future as Cryptologic Warfare Officers. As the talk came to a close, one of the Lieutenants raised his hand to ask me a question. He said, “Sir, my last two Commanding Officers appeared to be miserable. I truly believe that they did not enjoy being in Command. Why do you love it so much? Why does it seem to make you so happy?” As you might imagine, the question made me both sad and pleased. Sad that two of my peers had taken a red pill job only to execute it in a way that made others believe that it was something less than the most fulfilling role a leader could possibly have. It pleased me because in the 30 minutes we shared I was able to make it clear that I have never been happier professionally and that Command can in fact be the most fulfilling experience of an officer’s career. I answered the question to the best of my ability, acknowledging it wasn’t Command I loved as much as it was leading, connecting with, and coaching people. I did all of that long before I was a Commanding Officer and long before I was promoted to my current rank. And I choose to think it was that approach to every opportunity that resulted in my current assignment. The choice to ingest the red pill coupled with the enthusiasm to explore the matrix continues to make all of the difference in the outcomes we generate with our teammates and the journey all the more enjoyable for all involved. As I contemplate the pills left in the bottle, there are only two that I see as red. Meanwhile, just the sight of the blue pills that lead me straight to staff duty make me a bit queasy. My hope is the next pill I am offered will be red in color and lead me to one of the two opportunities I have made it clear I would like. To some, a job is merely an income stream. To me, it’s a means of fulfillment. I have zero interest in the blue pill. But if I am force fed one, I’m going to do what I always do: lead from it, connect with my teammates while exceeding expectations, and coach all who are interested in personal/professional development. After all, the red pill may not represent the opportunity. Instead, it may represent the mindset with which we embrace said opportunity. Maybe we can turn blue pill jobs red. Either way, I’m addicted to red pills and the associated mindset. Though I don’t intend to ingest anything that is blue in color, if I do, I will dive ever deeper into the rabbit hole leaving anyone watching with a strong belief that the pill was, in fact, red in color. When given a choice, do you find that you choose the red pill or the blue pill? Are there certain opportunities in life you are attempting to create? 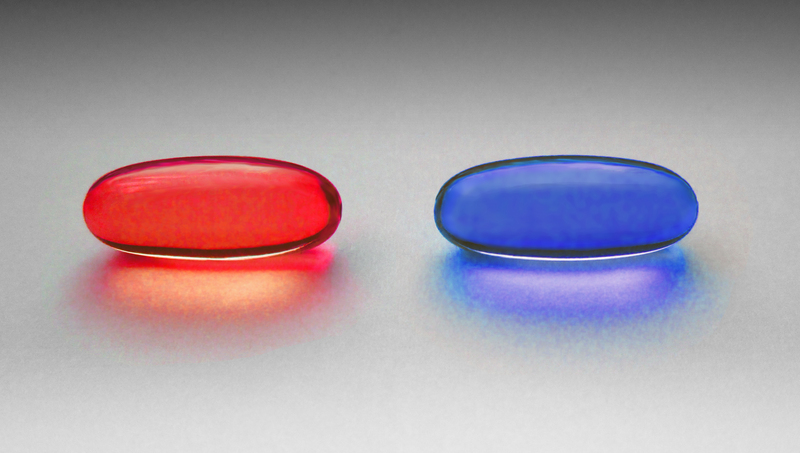 Are you able to execute a blue pill job with a red pill mindset?